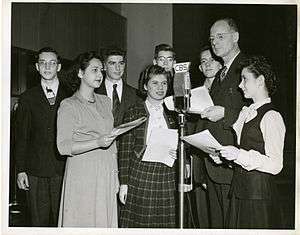 Science Service biology editor Frank Thone (1891–1949) interviewed seven finalists in the fourth annual Science Talent Search on an Adventures in Science radio broadcast, February 17, 1945. Left to right: Matthew R. Kegelman, Ruth Reichart, Andrew M. Sessler, Madeline Lenore Levy, Richard Henry Milburn, Andrew Streitwieser, Frank Thone, and Marion Cecile Joswick. Andrew Marienhoff Sessler (December 11, 1928 – April 17, 2014) was an American physicist, academic (University of California, Berkeley), former director of the Lawrence Berkeley National Laboratory (1973–1980), humanitarian and former president (1998) of the American Physical Society. Sessler was born in New York City in 1928. He was educated at Harvard University (B.A. in mathematics) and Columbia University (Ph.D. in physics). From 1954 to 1959, he was a member of the faculty at Ohio State University before moving to the Lawrence Berkeley National Laboratory where he served as Lab Director in 1973-80. His areas of expertise were the physics of particle accelerators, particle physics and plasma physics. In addition to accelerator physics, he also published theoretical work on quantum-theoretical statistical mechanics, atomic physics and superfluidity. Sessler was also active in the study group of the National Academy of Sciences of the long-term effects of the atomic bombing of Hiroshima and Nagasaki, and in an initiative group of APS against landmines. Sessler was a member of the American Committee for Peace in Chechnya. In 1970, he became an Ernest Orlando Lawrence Award laureate. On January 13, 2014, Sessler and Allen J. Bard were awarded the Enrico Fermi Award. Sessler lived in Oakland, California. He died in 2014 after a long illness. ↑ "Andrew Sessler 1928-2014". American Physical Society. 21 April 2014. Retrieved 26 April 2014. ↑ "Andrew Sessler, 2013". U.S. Department of Energy. 8 April 2014. Retrieved 26 April 2014. ↑ "In Memoriam: Andrew Sessler, Former Laboratory Director, Acclaimed Physicist and Humanitarian". Lawrence Berkeley National Laboratory. 18 April 2014. Retrieved 26 April 2014. ↑ Thomas, Jeremy (18 April 2014). "Former Berkeley lab director Sessler dies at 85". San Jose Mercury News. Retrieved 26 April 2014.